Construction on the new Sustainable Planet Center, the new headquarters building for the WWF-UK, continues on site with an anticipated completion of late summer this year. 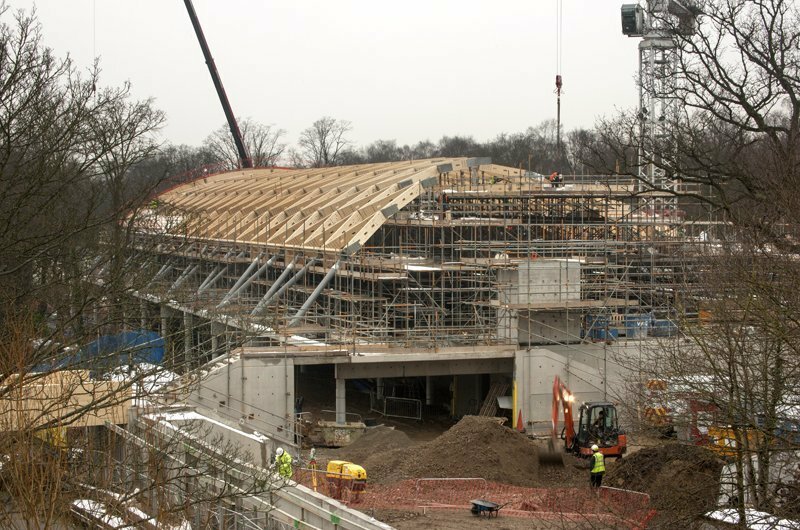 The innovative timber grid shell has now been installed, allowing the true form of the building to be observed for the first time on-site. The new building sits on a raised in-situ concrete podium whose perimeter will be planted with shrubs, trees and flowers, A new bridge from the town centre will lead to a public piazza at podium level connecting through to an internal public exhibition space. The accommodation totalling 3,600m2 is arranged over two-storeys and will serve as the headquarters for WWF-UK. The 80m long curved timber grid shell will span 837.5m providing long term flexibility for the WWF. The building will house an open plan work place for 300 staff, a 150 seat conference venue, education facilities and the WWF Experience exhibit.